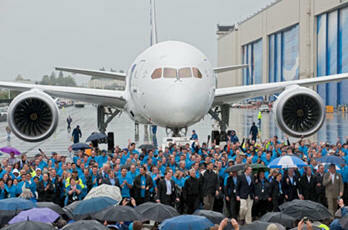 September 28, 2011 - Boeing celebrated the delivery of the first 787 Dreamliner on Wednesday to launch customer ANA during a ceremony adjacent to the factory where the airplane was assembled. More than 500 employees representing the 787 program walked alongside the all-new jetliner to present it to ANA executives as a crowd of thousands looked on. "Today we celebrate a significant moment in the history of flight," said Jim McNerney, Boeing chairman, president and CEO. "The 787 Dreamliner is the biggest innovation in commercial aviation since the Boeing 707 introduced the world to passenger jet travel more than 50 years ago. ?I want to thank ANA and all the employees of Boeing and our partner companies for the talent, technology and teamwork that have brought this game-changing airplane to life." "It's not often that we have the chance to make history, do something big and bold that will change the world in untold ways and endure long after we are gone," said Albaugh. 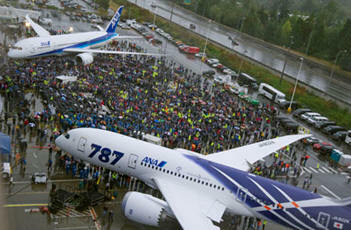 "That's what the 787 Dreamliner is and what ANA and Boeing have done together ? build what truly is the first new airplane of the 21st century." "We are delighted to be taking delivery finally of our first 787. ANA is extremely proud to be the launch customer for the Dreamliner and to have helped Boeing so closely in the development of this state-of-the-art aircraft," said Ito. "The Dreamliner will enable us to offer unrivalled standards of service and comfort to our passengers and will play a key part in ANA's plans for international expansion." Made from composite materials, the Boeing 787 Dreamliner is the first mid-size airplane capable of flying long-range routes and will allow airlines to open new, non-stop routes preferred by the traveling public. In addition to providing airlines with unprecedented fuel economy and low operating costs, the 787 features a host of new technologies that greatly enhance the passenger experience. ANA and Boeing completed the contractual delivery of the airplane on Sept. 25. ANA will fly the airplane to Tokyo Haneda Airport on Tuesday, with a scheduled departure of 6:35 a.m. (Pacific time) from Paine Field.